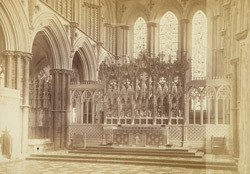 "The foundations of the present Cathedral were laid about the year 1082; and it is probable that the massive piers and arches of the south transept belong to that period...A Norman Church rose gradually...and, about 1174, Bishop Geoffrey Ridel completed the nave, with the lower part of the noble tower. Bishop Northwold pulled down the Norman apse, and built his new Presbytery to the eastward of the Norman choir." Text by Precentor of Ely W E Dickson from the book 'The Fen and Marshland Churches'.